Over the weekend, I just had to put one of my new books to the test. My sister bought me a new bread book as I only had the one, and I’m sure she is bored of me talking on about the same old recipes. Her gift was the best ever! ‘My Bread’ by Jim Lahey with Rick Flaste is one of those books you can’t imagine never having. I want to make everything from it. 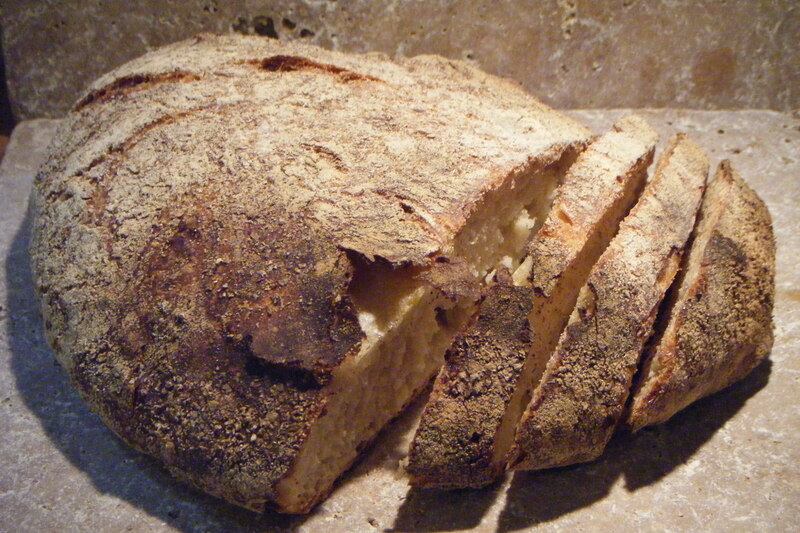 It is full of incredible breads of a fine bakery quality , no-knead, bake in a pot breads. Well not everything has to be baked in a pot, but for my first try, I made the signature basic no-knead bread recipe. you simple mix the ingredients and leave to ferment for about 24 hours (yes that’s right, a whole day!). I was sooo excited to try this, I magically threw all the dry ingredients together and mixed in the water. Took three minutes! I left it to ferment. I couldn’t resist checking it every so often, and that’s when my heart sank. After two hours there was no movement, five hours, still none, eight hours, nada! I went to bed and couldn’t stop thinking about my little dough mix. At three a.m. I woke up in a panic, talking out loud to myself and the cat ‘the bread must be so cold’. Our house isn’t the warmest during the night and I refuse to put the heating on just for the bread, so up I got and pottered downstairs. I made a hot water bottle and popped it under the bread bowl. Tucked it in and wished it a good night. The next morning (18hrs fermenting), very little movement. I poked it and yes it still seemed quite firm. My little bread was not fermenting. A new hot water bottle and another six hours later, the dough magically sprang up and the surface was dotted with little bubbles. It still wasn’t very big but after a whole day (and some), I was running out of patience and so I decided to move onto the next stage. So I hesitantly ploughed on and popped the dough out of it’s bowl, dusted it with flour and placed it in it’s towel for the next stage of rising. I heated my pot and when it came time, I popped the dough into the pot added the lid and wished it good luck and closed the oven door. Fingers crossed and half an hour later, I took the lid off and voila, miracles do happen. It actually looked like bread, another while in the oven to brown further and then it came out. I had never been prouder! 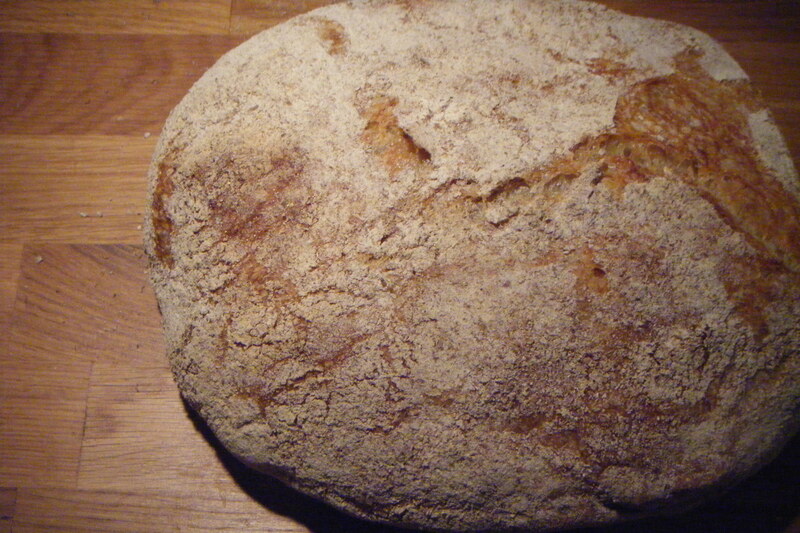 It actually looked like a traditional rustic bread loaf. 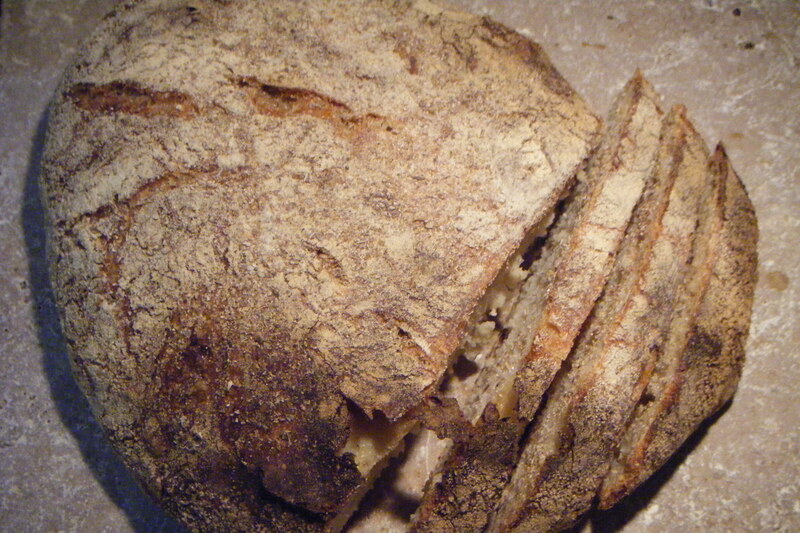 And it tasted fantastic too, crunchy crust and light and moist inside with actual flavour. I have made simple loaves before but they just taste, well like a white loaf. No individual flavour, but this one was devoured in no time. This was good and bad, good for learning a new bread but bad as I couldn’t shut up talking about it for the next twenty four hours (I’m quite serious!). I haven’t changed this recipe much and am giving it to you the way the book says so you can try this they way it is meant to be tried. Mix all of the dry ingredients in a medium bowl. Add water and incorporate by hand or with a wooden spoon or spatula for 30 seconds to 1 minute (it will be sticky). Cover the bowl with plastic wrap (and a plate as in my case the cling film isn’t that clingy) or tea towel and let the dough rest 12 hours (18-24 hours if your house is as cool as mine) at room temperature (approx. 65-72°F). 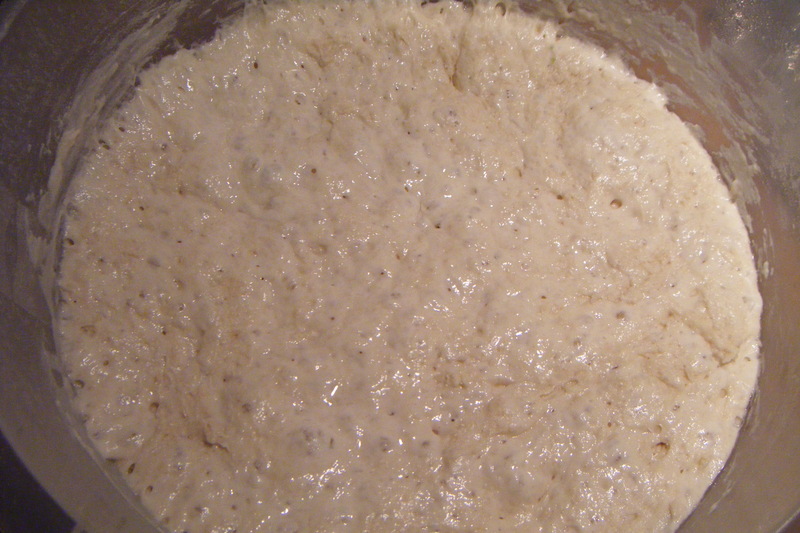 When the first rise is done, the surface will be speckled in little bubbles and will have doubled in size. Generously dust a work surface with flour and remove the dough from the bowl, it will have long thin strands attaching it to the bowl. This is the developed gluten. 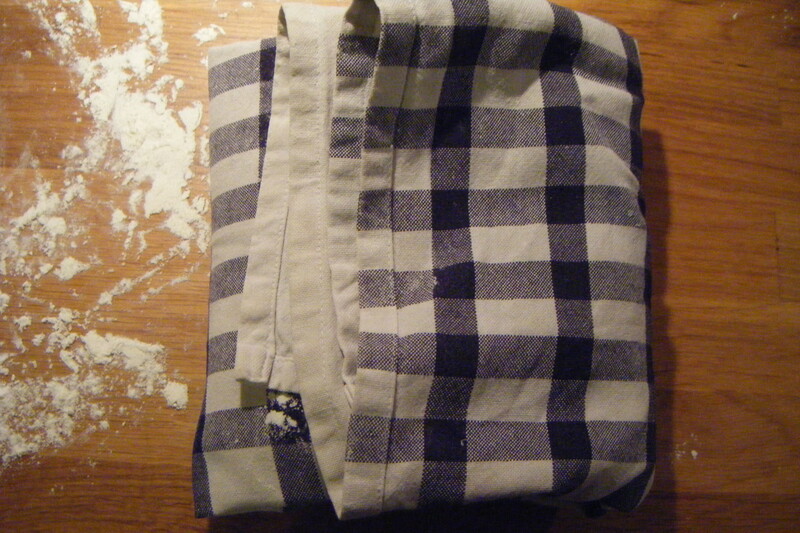 With floured hands, gently and fold in the edges once or twice to form it into a ball (seam side down). Again generously coat a cotton towel with flour, wheat bran, or cornmeal; place the dough seam side down on the towel and dust the top with flour. 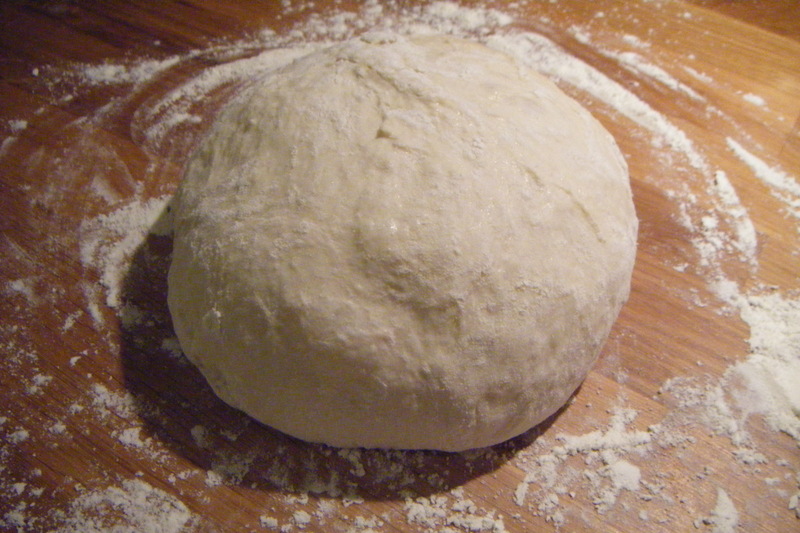 Fold the edges of the towel over the dough and let rise 1-2 hours at room temperature, until more than doubled in size. Preheat oven to 450-500°F (230 degrees). 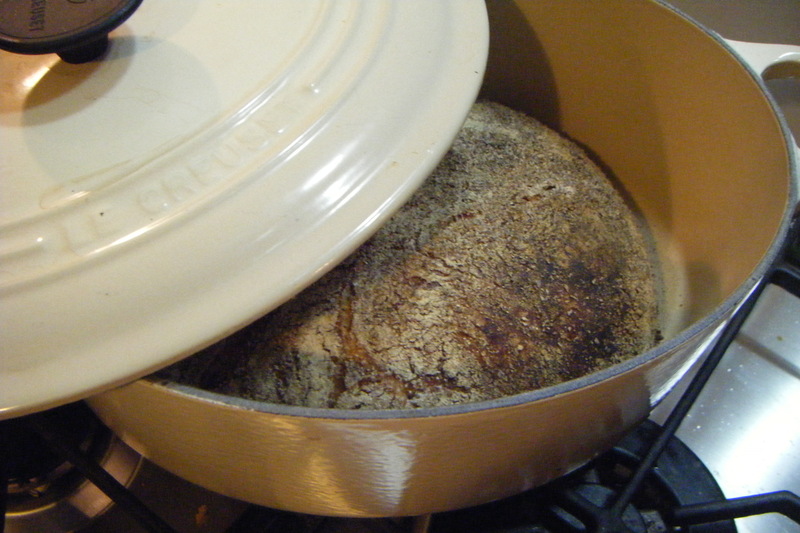 Place a lidded pot in the oven at least 30 minutes prior to baking to preheat. 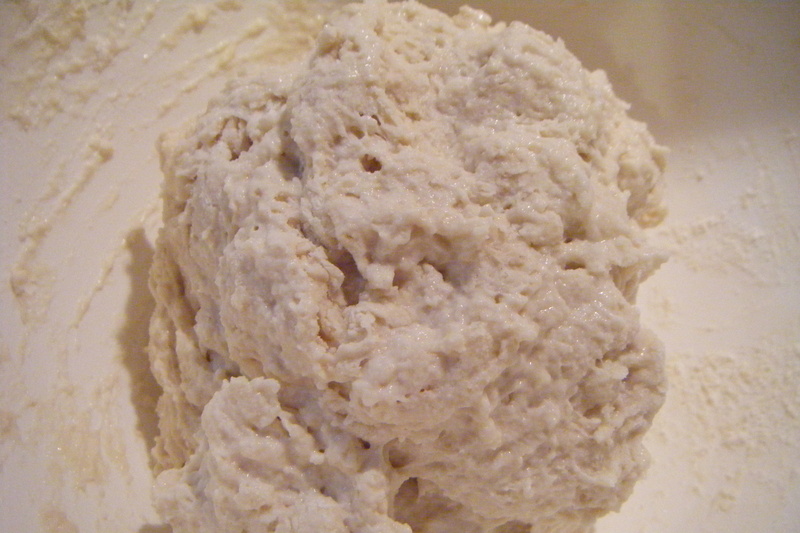 Once the dough has more than doubled in volume, remove the pot from the oven. 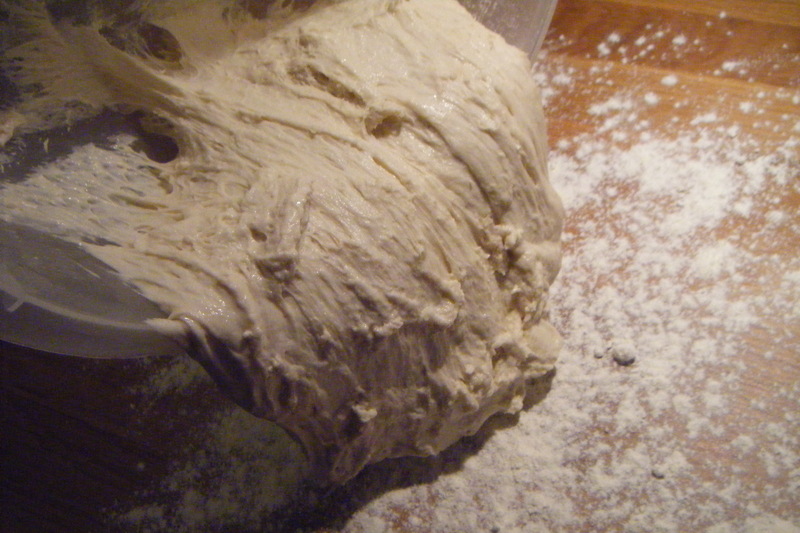 Dust the dough with flour and place the dough in the pot seam side up. Cover with the lid and bake 30 minutes Then remove the lid and bake 15-30 minutes uncovered, until the loaf is nicely browned. I have made this a few times already and each loaf has turned out slightly differently in appearance so do not worry, it will still taste amazing! That looks fantastic! Great crumb. And fantastic crust. 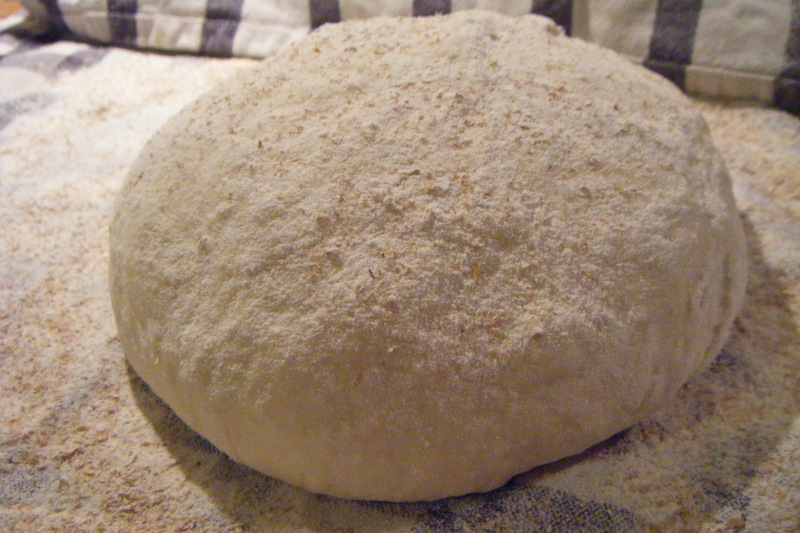 I love that breadmaking technique… I’ve tried a few times using a dutch oven and slow fermentation… great flavour and crust!